The famous De Grisogono watchmaking house was established in 1993. A talented and genius watchmaker and jeweler called Fawaz Gruosi started this company in Geneva, the place where many famous and honorable firms producing luxurious timepieces were founded. Besides manufacturing horological devices of high-end quality, the famous brand creates prestigious and elegant accessories and jewelry. In 2000, the first collection of De Grisogono watches was launched to meet the huge success and popularity among the wealthy and famous people of the world. A distinctive feature of the De Grisogono style is dark shades of black diamonds. Since 1996, the company has produced magnificent jewelry made in dark colors and complemented with precious gems and metals. The same shapes and colors are currently used to create watches of the high-quality. This harmony between jewelry and horological devices charm the brand’s most devoted customers and induce them to buy more products because they fit each other perfectly. One can think that the only color featuring in every masterpiece of the famous watchmaking house is black. 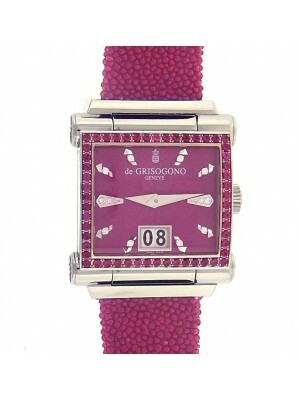 However, De Grisogono timepieces are presented in a great variety of shapes and colors. For instance, women’s watches are generally made of precious and semi-precious gems of different colors to decorate these articles of luxury in the best way. The case or body of timepieces is made of rose or yellow gold. The company can offer many sophisticated men’s horological devices that can show not only time but also some other important indications. It is exactly that what every man wants to get and wear on his wrist. Besides, the classic form and accurate finishing make the watches suitable for both some special occasions and everyday life. This brand gained a reputation of the luxury, exclusive company due to its striking and astonishing high-end products displaying two time zones. For this reason, numerous connoisseurs and collectors choose new and pre-owned luxury watches of the De Grisogono company. One of the most interesting masterpieces of the famous watchmaking house are extraordinary watches that can be used as both analogue and digital devices. Recently, the brand introduced some wonderful collections of unique and outstanding timepieces called Instrumento Grande. New models of watches are perfect and strikingly beautiful. Large cases, colored dials, and luxurious straps made them bestsellers on the watch market almost instantly. De Grisogono products are distinguished by their sumptuous style fulfilling the requirements of every watch snob and demanding customer. The wonderful brand has a reputation of the exclusive watchmaking company creating timepieces and accessories for movie stars, as many actors and actress wear its products during different events and festivals like the Cannes Film Festival, for instance. Naomi Campbell and Demi Moore are fond of perfect and extravagant brand's watches. That is why, don’t miss a great chance to possess the article of luxury that every wealthy and successful person has and buy unique and prestigious De Grisogono watches. We can offer you different models of the gorgeous brand at attractive prices here. Show your taste with De Grisogono watches.